Police say a 15-year-old student was arrested Saturday night after making a threatening statement on Facebook. 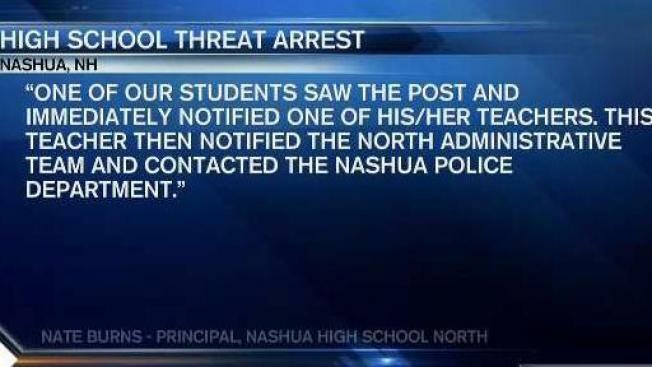 The comment, discovered by a student, was allegedly targeting Nashua High School North in Nashua, New Hampshire. This is the second student arrested for making social media threats in just the last three days. On Friday, a student allegedly threatened to bring a gun to Lowell High School. A 15-year-old Nashua, New Hampshire high school student was arrested Saturday night for allegedly posting a threat on social media directed at Nashua High School North. Police are not releasing the name of the student who was arrested. Police say the threat was violent and not directed toward any particular students, teachers, or faculty at this time, but the investigation is ongoing. Meanwhile, school is still on for Monday. Investigators say they received the call at noon on Saturday, and the teenager was arrested nearly eight hours later. Anyone with information is asked to contact the Nashua Police Department at 603-594-3500. This is the second student arrested for making social media threats in just the last three days. On Friday, a student allegedly threatened to bring a gun to Lowell High School in Lowell, Massachusetts. Administrators contacted police before the threat ever had a chance to materialize. Just like the case in Nashua, police are not releasing the name of the student who was arrested.